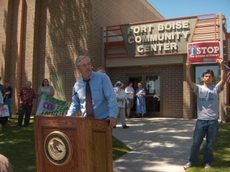 I'm in downtown Boise, where disgraced U.S. Attorney General Alberto Gonzales refused to appear at a scheduled press conference when about 75 more than 100 protesters (including Jean Boyles of Boise, at right) showed up on the east side of the Fort Boise Community Center, where he was supposed to meet the media. Former 1st District congressional candidate Larry Grant, who plans to run again in 2008, took the podium and told the crowd, "I think he heard you when he didn't come out," adding that "we need a new attorney general" who will stand up to an administration when it advocates for torture. "We're deeply concerned about America's standing in the world," 2nd District congressional candidate Jim Hansen told the group earlier, as people gathered for Gonzales' arrival. "To start the healing process, we'd welcome him to announce his resignation today." "I think it's a snub on the people of Idaho," said Bob Nicholas, who arrived at the protest riding a Segway. Gonzales was in town to discuss anti-gang initiatives and tour the Fort Boise Community Center, which has extensive teen activities to give youth alternatives to gangs. Earlier in the day, Hansen, Grant, and Dan Williams held a press conference to ask for Gonzales' resignation. Greg Hahn wrote on the Idaho Statesman website, "'I applaud him for being here to talk about gangs,' Grant said, but he added that these good intentions don't shroud the bad influence Gonzales has had on America's image around the world." There's more on the day's events at Fort Boise and New West. The Idaho Democratic Party and Ada County Democrats also released statements protesting of Gonzales' visit to Boise. A special atta-boy to Jim Hansen for organizing today's protest. Update 8 p.m. 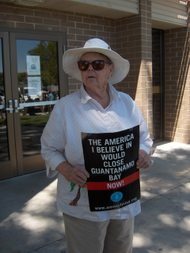 I've just posted a diary at Daily Kos, too. F*cking coward. THAT pissed me off - royally. They think they're clever, don't they? They don't even have the courage of their convictions. Because if they did, not a damned one of them would mind AT ALL facing any audience. Keep in mind ole' Abu isn't much taller than you or me, Julie - so yeah a group of old ladies, a couple of men (who apparently work nights! ), and some 12-year-old kids on skateboards were all just too intimidating. Oh and BTW, Larry Grant sure appeared 'nicer' than Popkey's column. Thanks for the update Julie. Couldn't get out of a meeting but I was there in spirit. Good job everybody. I hope to see your efforts rewarded in the news tomorrow. I was so impressed with all the people who gathered. Jill Kuraitis counted 114 with more coming even as the AG's spokesman slinked away. That's with less than 24 hours notice! Thanks for being there, Julie, and for making sure so many people heard about it. You made a big difference. Hope you can post some photos! Perhaps our next step is to ask our congressional delegation to demand Gonzales's resignation since he was so disrespectful to their constituents. Yes, I've noticed I have the lowest crowd count of anyone. The Statesman said 100+. And it was great to see Larry Grant show up and seize the moment. Kitt, I agree that Gonzales and his handlers are cowards. I knew five minutes after arriving that there was no way they'd let Gonzo meet the press outside, amid We the People, the people who pay his salary. They ought to be ashamed indeed. Your wish for the pix has been granted, Jim. I have to run do some stuff, but I will have an updated diary up at Daily Kos later this evening. Thanks for puttiung this together. Just heard the story on NPR and was amused to hear that they described the songs we sang as anti-war songs! That's great. For the record, the two songs we sang were the Star Spangled Banner and This Land is My Land. The national anthem is an anti-war song. Rockets red glare .... bombs bursting in air ... definitely an anti-war song! You sure that wasn't on Fox, Jim?! Thanks for being there Julie, and for the update! And kudos to Jim for his work organizing for today. We also sang "America the Beautiful," one gal did an impressive solo of a Tom Lehrer song (we think it was, can't recall the title), some of us tried a little Political Science (Randy Newman), and Fixin' to Die Rag. Jeanette suggested The Doors' "Back Door Man" as we left the scene, which found its way into my blog headline. I also suggested to Jeannette we sing "Hit the Road, Jack" but figured I'd forget the next verse...What an unassuming, unthreatening group of great Americans. Nothing would've stopped us from going around to the other side of the building I suppose.....the cavalcade was parked there. Wow, nice job everyone. It was the top story on KTVB at 5:00 tonight. I wish I could have been there in person. Gonzo doesn't get a free ride--even in Idaho! Jill, your account is great at New West. I mentioned it at Kos, too. Nice work. I actually still have a press pass from the American Society of Journalists and Authors. I guess I could've gone, but I didn't have it with me.